Should I get bi-fold doors? Bi-fold doors are a popular choice, both for patio or garden access, or to separate a living room or kitchen from a conservatory. Wherever you put them, they’re a great way to create a seamless transition between your home and garden. In the summer months there’s nothing better than being able to pull back the doors and wander in and out freely during a family party or while the kids are playing outside. However, there are a few things to consider when deciding if you should choose bi-fold doors for your house extension. There are three main types of patio door: sliding, French and bi-fold doors. Sliding doors are usually two or more large panes of glass, which move behind one another to allow access to the outdoors. The main benefit of sliding doors is that your view remains as unobstructed as possible when they’re closed. However, they can’t fully fold away, so you’ll only ever have unobstructed access through two thirds of the entrance. French doors are the classic choice, and are usually considered to be the most aesthetically pleasing, particularly in older homes. These are traditional doors with a number of small windows, which open out. French doors are usually the most affordable option, but will probably obstruct at least some of your view, and may feel clunky in a modern house. Bi-fold doors are made up of a number of tall, thin panels, which concertina away to the side of your doorway, providing maximum unobstructed access to the outdoors when fully open. What are the pros and cons of bi-fold doors? As you can see, bi-fold doors are able to provide the most unobstructed view and best access to your garden. However, the frames around their upright panels can restrict this same view when closed. In terms of materials, bi-fold doors tend to be manufactured in either timber, aluminium or uPVC, and each of these can also change the feel of your room. 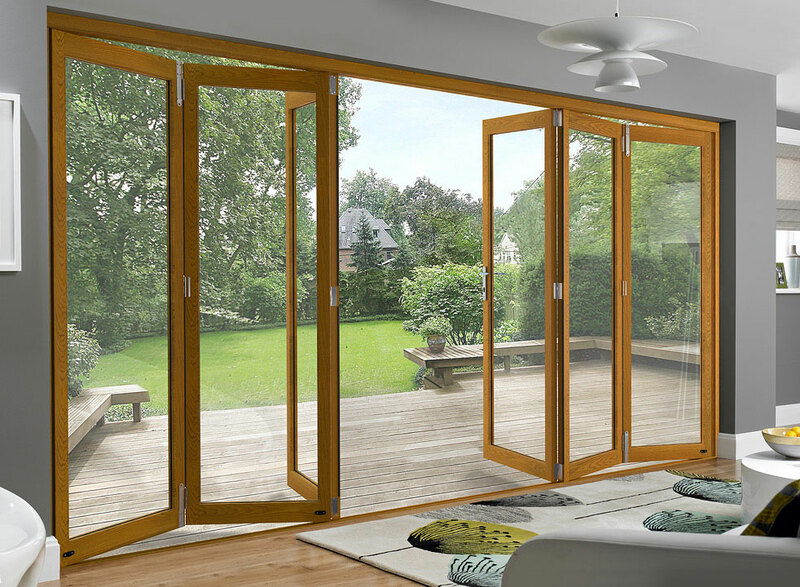 Timber bi-fold doors require more maintenance, while uPVC may expand and contract under temperature fluctuation, causing jamming. Aluminum bi-fold doors have better structural integrity, but are usually more expensive. Speak to your architect before they put together your architectural floor plan for your housing extension, and they’ll help you to decide if bi-fold doors are right for you!